Camp Jotoni provides summer recreational services for children and adults with developmental disabilities. Our programs consist of a six-week day camp program, a six-week residential program, and three weeks of extended summer day camp for school age children. Campers have the opportunity to practice motor skills and develop an appreciation for their talents in each of these areas. Each program is adaptable to the needs and challenges of each camper. Social skills are an underlying theme to our program and are reinforced daily through various activities. 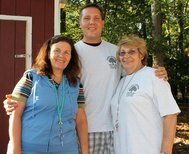 Camp Jotoni's administration consists of knowledgeable special education teachers. Each member of the administrative team has a minimum of seven years experience at Camp Jotoni. Camp Jotoni makes every effort to ensure that positions are filled with high quality, enthusiastic, and caring individuals. Most staff in these positions are college age students or teachers. Recruitment has expanded both nationally and internationally due to our website and Internet-based links to our information. Our infirmary is staffed by an RN or an LPN who follows established treatment procedures authorized by a physician. Only a trained professional administers medication. Camp Jotoni is licensed to accept 100 participants daily. A maximum ratio of four campers to one staff is not exceeded during any camp sessions. During "day camp only" sessions the ratio often intensifies to two campers with one staff personnel. One of five residential cabins accommodates campers with physical handicaps. Two bathhouses provide accessible bathing facilities for the campers. Meals are served in our spacious dining hall and are made in our own modern kitchen. Licensed nutritionists create menus with attention to special dietary restrictions.